9/11/09 – Acquisition – Valence, Musée des Beaux-Arts – Born in Florence in 1695, Jean-Nicolas Servandoni, who spent most of his career in France, is known as an architect (he did the façade of the Church of Saint Sulpice in Paris) and theater decorator. He was also a painter, exhibiting regularly at the Salon between 1736 and 1765 and entered the Academy in 1731. His reception piece belongs to the Ecole des Beaux-Arts and can be seen at the moment in the exhibition L’Ecole de la liberté. Etre artiste à Paris 1648 -1817. His other known paintings are rare and started appearing again only in the last few decades ; older articles on the artist only mention the one at Beaux-Arts . In 1992 and 1994 two canvases in vertical format came up for auction in Paris at the Hôtel Drouot representing seascapes in the manner of Joseph Vernet, apparently originally hanging in Servandoni’s dining room . 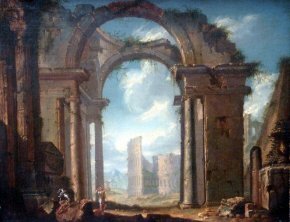 Most of these paintings, however, like his reception piece or the one belonging to the museum in Lyon , are architectural capriccios, often with a similar composition : modern imaginary ruins in the foreground form a sort of arch of triumph, through which one glimpses a view of ancient Rome, while small figures in the manner of Salvator Rosa fill the lower front part. The painting acquired by the Musée des Beaux-Arts de Valence (from the Michel Descours Gallery in Lyon), a very beautiful Roman Capriccio with the Coliseum and the Cestius Pyramid (ill.), corresponds exactly to this description. The Musée de Valence is well known for its collection of Hubert Robert paintings, to which it added, through a preemption, A Waterfall Landscape with Arcadian Shepherds (see news item of 26/6/04 in French) five years ago. Its acquisitions policy thus naturally tends towards those artists who, like Robert, found their inspiration in Italy producing works with similar themes, notably that of a landscape with ruins. This work by Jean-Nicolas Servandoni therefore fits right in with the others already in this rich collection. See for example : J. Bouché, “Servandoni, 1695-1766”, La Gazette des Beaux-Arts, 1910, II, pp. 121-146. Several photographs of these paintings can be found in the Servandoni file at the Service d’Etude et de Documentation of the Département des Peintures at the Musée du Louvre. This painting had been attributed to Panninni previously.